Thai people are originally from southern China. Thai massage is an about 2500 years old therapy and the technique has been affected by medical practice in China. 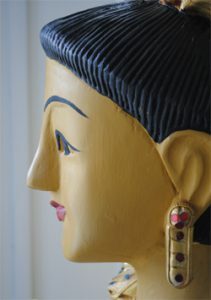 Focusing on energy points are part of the Thai massage connected with ancient Chinese medicine. In addition, the Thai massage is influenced by Indian yoga and Tibetan traditions. Thai people came simply in contact with many different people who all made their contribution to what is now called Thai massage. The tradition of making Thai massage has been passed on from teacher to student and also from parents to children. In 1776 Siam (now Thailand) was invaded by people from Burma. Then the foreigners from Burma unfortunately destroyed most of the ancient writings about medicine. The only remainings were some stones engraved with ancient texts and these stones are still in the Buddhist temple of Wat Pho in Bangkok. In Wat Pho is today a center for traditional Thai massage and medicine.